Celebrating the best in underground UK bass culture with Wiley, Goldie, Zinc, Digital Mystikz, Joker, Loefah, Youngsta, DJ Luck & MC Neat, Oxide & Neutrino, Trojan Sound, Channel One, Zed Bias, Paleman and many more. Born & Bred will celebrate some of most exciting genres that have defined underground music in the city over the past twenty years. Looking to the grass-roots of music culture in the capital, the festival programme salutes a set of true pioneers in their respective scenes. The line-up hosts a set of artists responsible for representing the city we love on a global scale and unifying generations with genuinely game-changing sounds that look to both electronic and bass music culture. Through dub to dubstep and garage to grime, UK bass culture has consistently pushed boundaries and spread its influence across the globe. Celebrating some of the finest home-grown talent, Born & Bred’s main stage will thus be headlined by Godfather of Grime, Wiley. 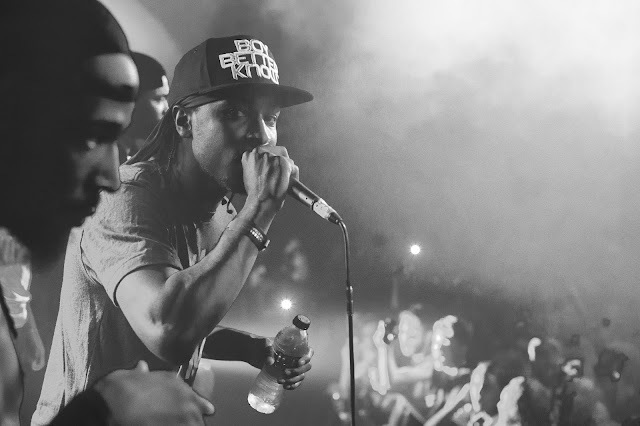 As notorious for crossover singles like ‘Heatwave’ and ‘Wearing My Rolex’ as he is for delivering some of grime’s most iconic independent records, Wiley’s proud East London roots make him a natural choice to perform. He’ll also be joined by Metalheadz founder Goldie - an influential figure in the world of drum & bass, regarded for helping to shape the face of the genre in the UK. Pioneering DJ/producer Zinc is also set to perform - an artist instrumental in shaping contemporary club culture since the release of classic drum & bass record ‘Super Sharp Shooter’ released back in 1995 - and will be joined by dubstep icons and DMZ founders Digital Mystikz aka Mala and Coki, with Bristol’s Joker also set to showcase new live project ‘The Mainframe’. Bringing carnival vibes to the main stage programme are bashment crew The Heatwave - famed for their nationwide series of ‘Hot Wuk’ club nights - with Soundclash veterans Channel One and Trojan Sound showcasing a host of foundation dub classics in support. NTS Live radio show host DJ Moxie is also set to make her Found debut, with up-and-coming production duo Silas & Snare Surgeon slated to open main stage proceedings. Loefah’s Swamp81 imprint will curate Born & Bred’s second arena - headlined by the label boss himself - alongside a slew of label artists. Wheel & Deal affiliate Benton, School Records boss Klose One, Swamp regular Mickey Pearce and latest label recruit Paleman - best known for 2014 underground anthem ‘Beezeldub’ - are all set to perform. Rinse FM’s Youngsta - a key figure in the expansion of dub label Tempa - will also join Loefah and friends, alongside further label associates Zed Bias, MC Chunky & Jonny Banger. First established as grime-focused YouTube channel Don't Watch That TV back in 2009, London based events and music series JUST JAM are to take control of Born & Bred’s third arena with an electric custom live visual display providing the backdrop. 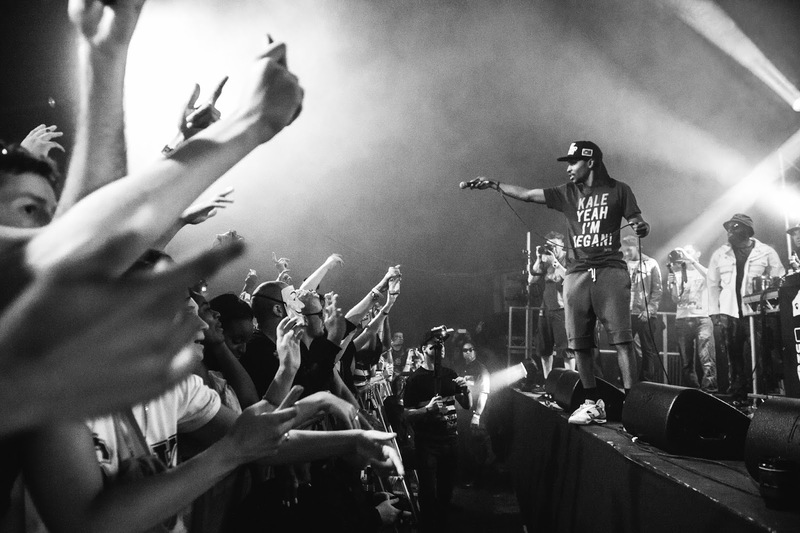 Headlining on the day are grime crew OGz - featuring P Money, Blacks, Little Dee, Jendor, Desperado and Stormer - who are also to be joined by legendary grime MCs D Double E & Footsie, the Newham Generals. Comprised of 10 members - a fluid mix of producers and emcees - Lewisham-based collective The Square represent the next generation of conscious-minded, new school grime artists and are the next to take to the JUST JAM stage. Fronted by recent XL Recordings signee and BBC Sound Of 2015 nominee Novelist, the crew can already boast a live performance at Milan Fashion Week - as well as numerous appearances on BBC 1Xtra, Rinse FM and NTS Live - since the release of debut mixtape ‘The Formula’ in 2014. Leading grime DJs Logan Sama and Sir Spyro - as well as Rinse stalwart Scratcha DVA and Butterz’ grime-garage protégé Royal-T - will all represent the station alongside special guest T.Williams, who is to play under his grime moniker ‘Dread.D’ for a one-off 2002 - 2005 grime set. 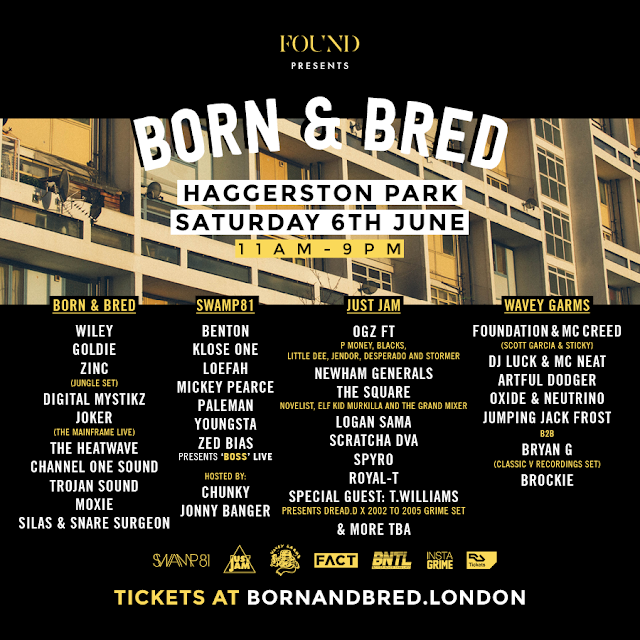 Influential street-wear tastemakers Wavey Garms are to host Born & Bred’s fourth and final arena, enlisting a special cast of UK Garage pioneers in Scott Garcia and Sticky - who will headline as Foundation alongside MC Creed - and DJ Luck & MC Neat. Legendary garage duo Oxide & Neutrino, V Recordings label heads Jumping Jack Frost and Bryan G and Jungle icon Brockie complete the bill. 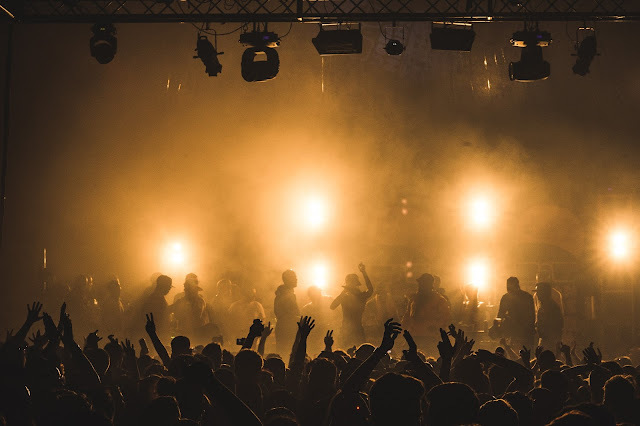 In just two years FOUND has forged a reputation for producing breathtaking events across London, amongst those pioneering the melting pot of sub genres that came to define the re-birth of house and techno in the capital and London's love for all things electronic. After launching in 2011 with a series of 15 underground club events, one-of-a-kind street parties have seen the likes of genre-defining godfathers Frankie Knuckles, Kevin Saunderson, MK and Todd Edwards perform in remarkable outdoor surroundings. Dyed Soundorom, Dusky and Deetron are some of the many others to have performed at FOUND’s celebrated warehouse after parties. House queen Maya Jane Coles headlined 2013’s debut FOUND Festival in the heart of Shoreditch with Damian Lazarus and Louie Vega following in her footsteps in 2014 as FOUND opened and closed summer in London with not one but two stellar festivals, returning to Haggerston and launching Ceremony at Finsbury Park.